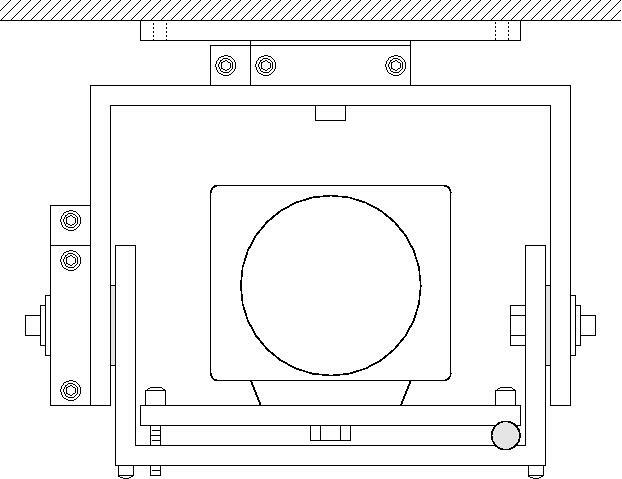 RM3 for larger box cameras or small environment housings. 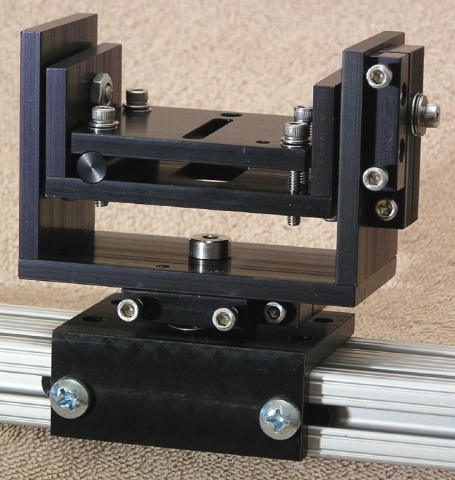 3-Axis Adjustment of pan, tilt and roll. 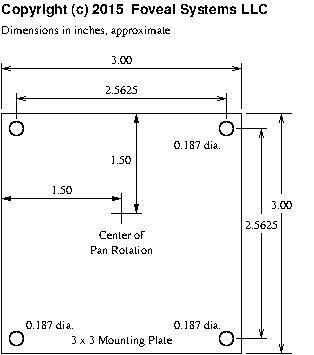 Fine Adjustment of all axes. 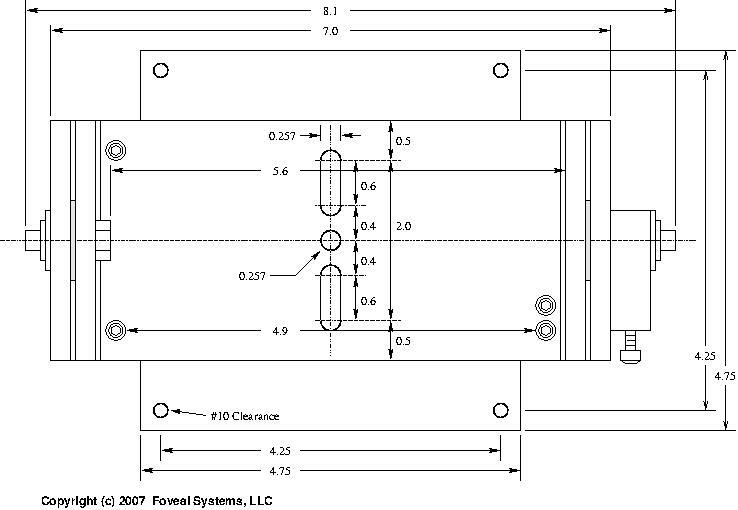 Individual axis lock down makes adjustment easier, more precise, and prevents accidental change. 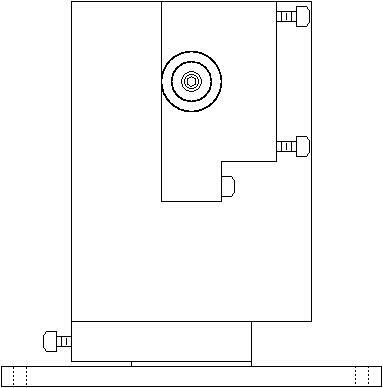 Click to enlarge pictures and drawings. 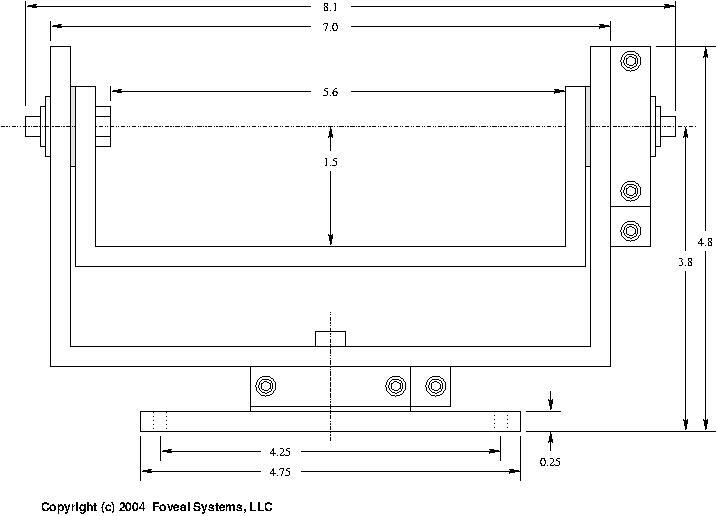 A key element in creating reliable AutoAuditorium System installations is ensuring that the Tracking Camera and Spotting Camera stay in precise alignment relative to each other. 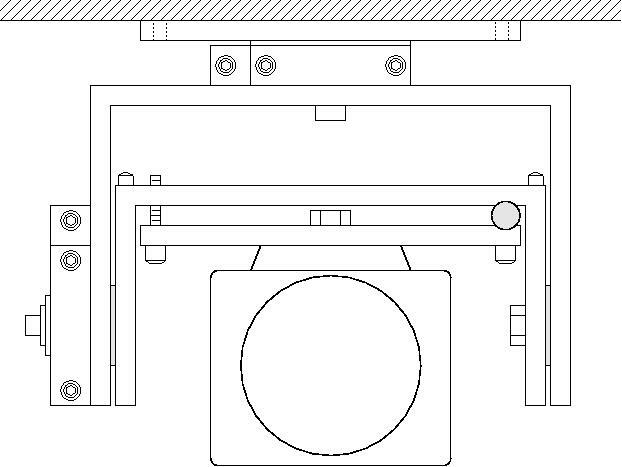 The Tracking Camera has pan and tilt positions which must be related to specific points in the Spotting Camera image, and those relationships must be fixed and permanent. 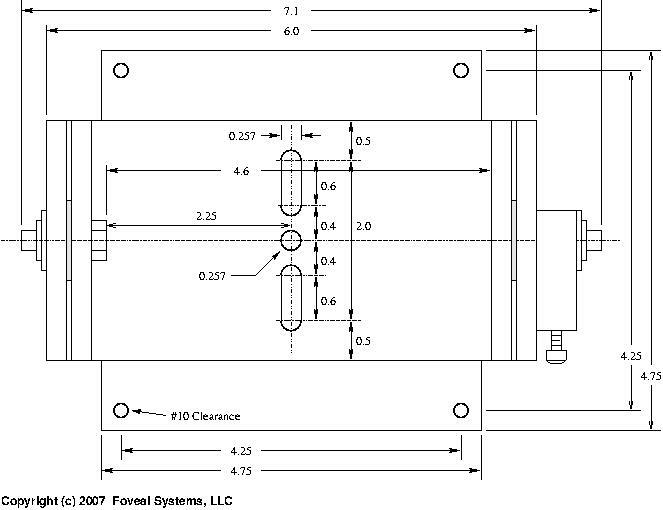 In the past, misalignment has been an all-too-frequent cause of Tracking Camera errors. 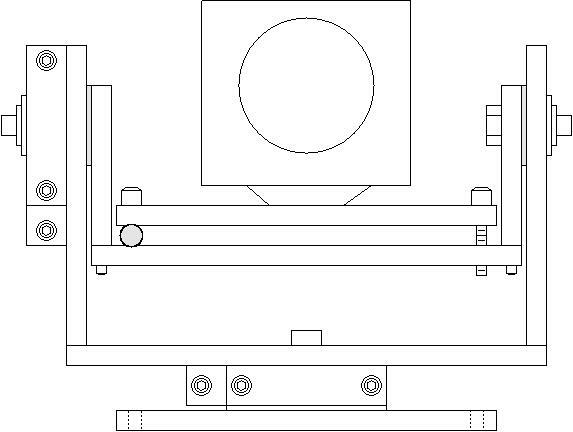 A key element to keeping the Spotting Camera image aligned with the Tracking Camera is to guarantee that once the Spotting Camera is positioned, it does not move. 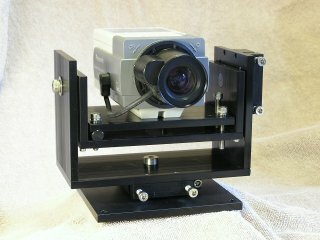 We were unable to find camera mounts that permitted fine adjustment in the pan, tilt and roll axis that then locked in those adjustments, so we designed our own. We also have used the 3-Axis Rigid Camera Mount for the Slide Camera, to ensure that it is always locked into the same position pointed at the projection screen. 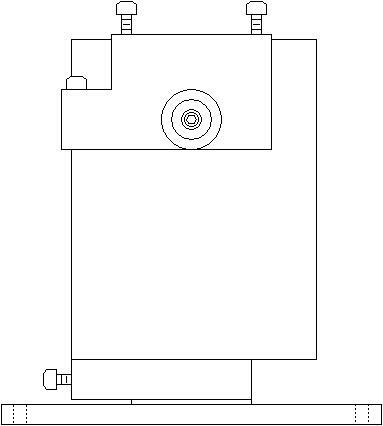 The ability to finely adjust the roll position of the camera makes it much easier to set the Slide Camera image absolutely square with the projection screen. Customers of the Rigid Mounts include companies installing machine-vision technology for laboratory and manufacturing use. 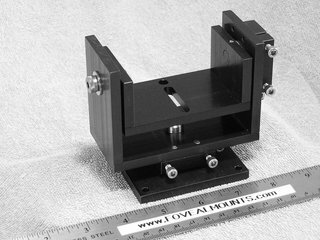 These camera mounts are also suitable for other types of instruments and sensors. 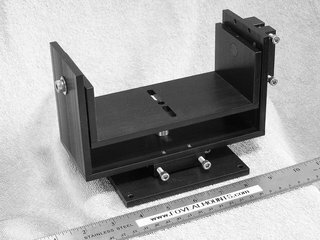 Custom Widths to accommodate wider cameras, instruments, sensors, are available. 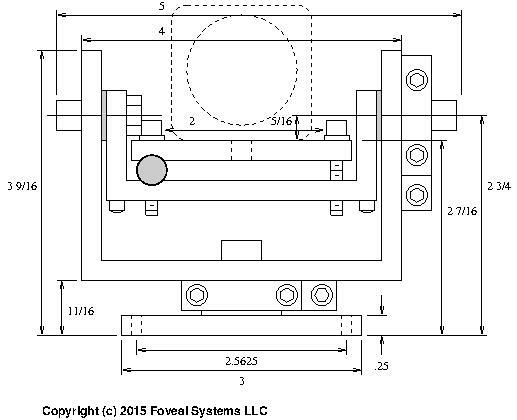 For a less expensive, less robust, two axis mount that features fine adjustment and locking of the pan and tilt axes, see the Foveal 2-Axis Fine-Adjustment Camera Mounts. 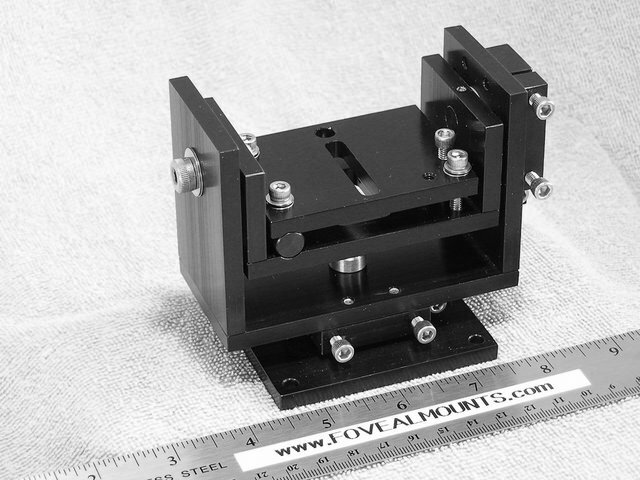 The 3-Axis Rigid Camera Mount may be supported with the base down or the base up. 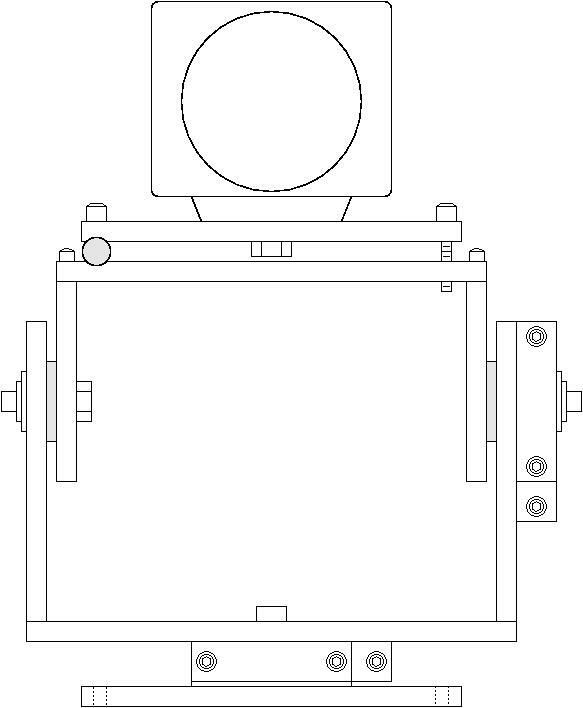 In either position, the plate the camera attaches to can be either below or above the camera. 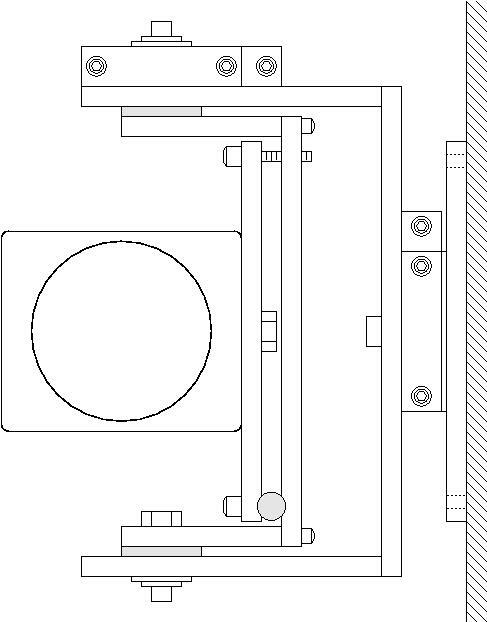 When unlocked, there is sufficient friction to hold the camera in position. Coarse position can be set by hand. Fine adjustments are made using a hex wrench, allowing for extremely fine positioning. 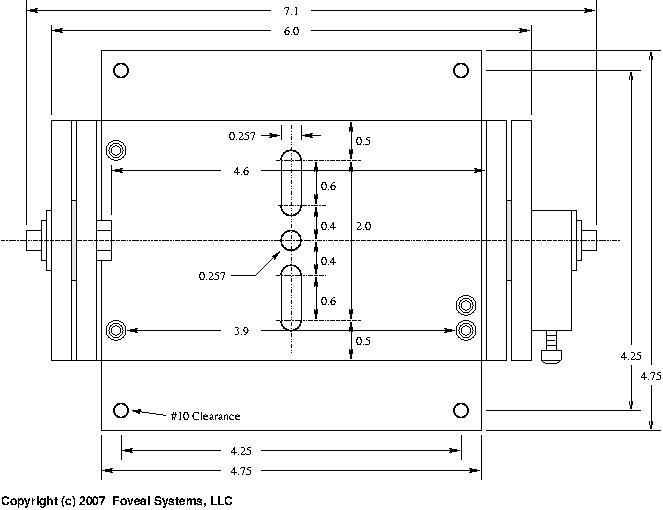 Independent adjustment of each axis means each adjustment does not affect the other two. All adjustments and locking are made with a single hex wrench. Once the mount is locked, the camera does not move. 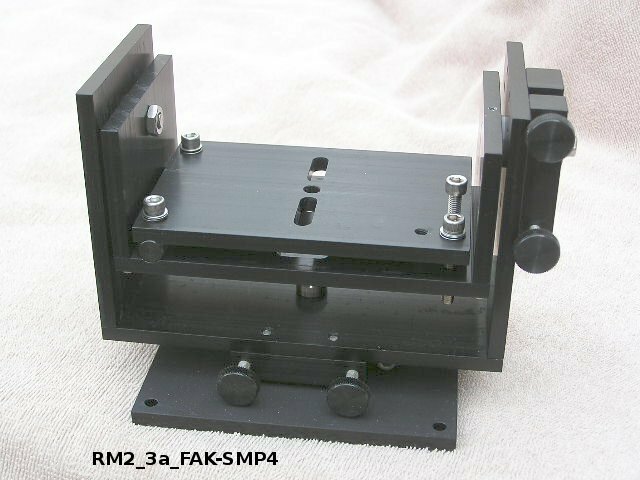 As a testimonial to that last statement, one customer tells us that they found a heavy tool belt hanging on one of the RM3_3a Mounts on their factory floor. The machine vision camera had not moved. the amount it overhangs the mounting plate. 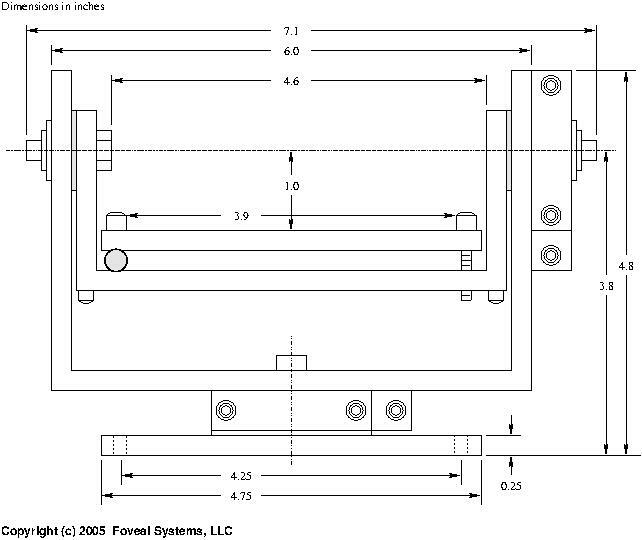 † The RM1m_2a and RM1m_3a mounts are built with metric standard screws and fasteners instead of ASME (American Society of Mechanical Engineers) standard screws and fasteners. Please call before ordering. Custom Widths to accommodate wider cameras are available. 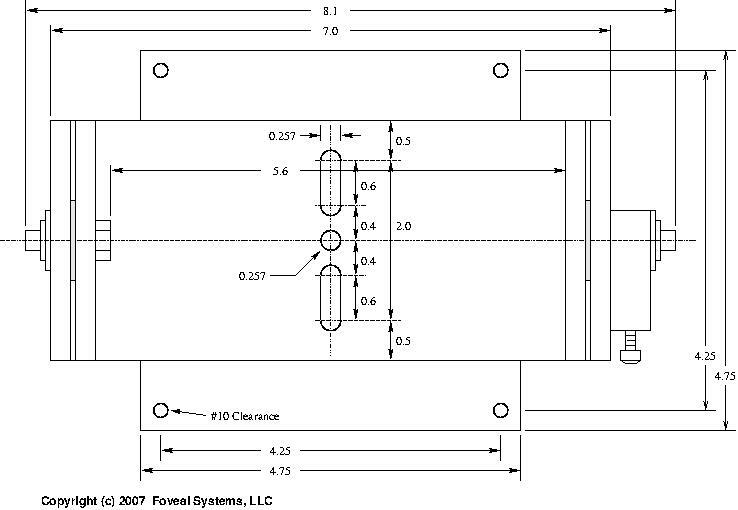 When the need is not set it and forget it but instead the mount frequently needs to be finely adjusted, we offer knobs for the fine position adjustment screws. 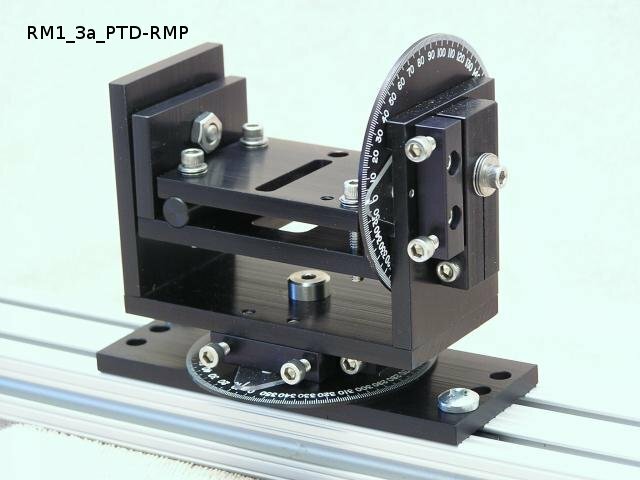 We offer mounts with Protractor Dials on both the Pan and Tilt Axes so the angles can be read out. 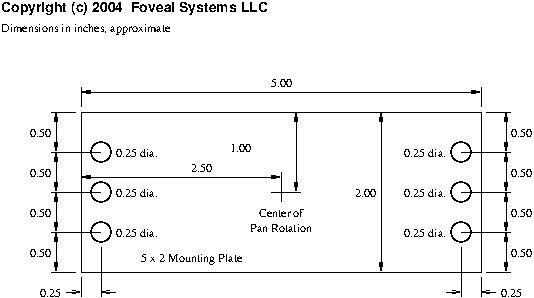 See the complete description at Foveal Mounts with Pan and Tilt Protractor Dials. 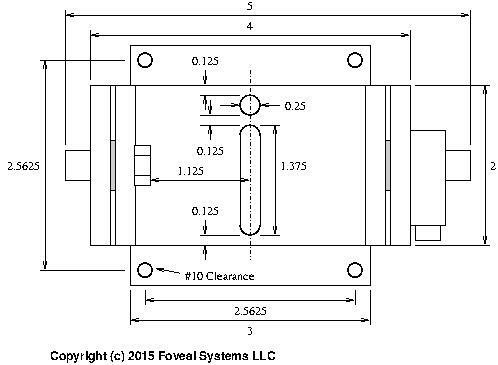 This option provides even finer adjustment than the Extra Fine Adjustment (EFA) Option, above. There are actually two adjustments made using two different hex keys. 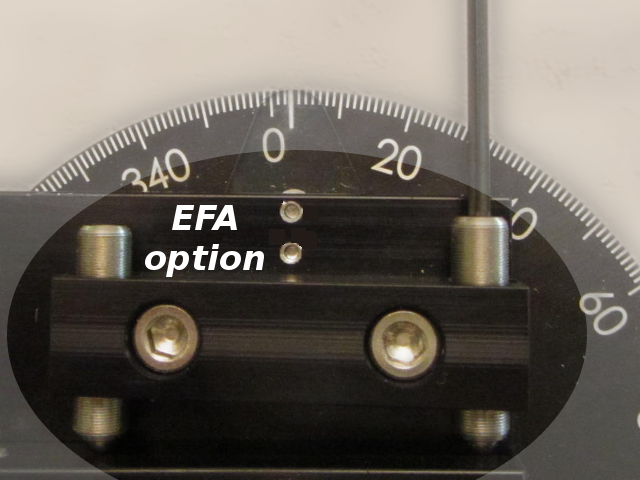 The coarse adjustment is the same as the EFA option, approximately 1 degree turn of the larger hex hey. The fine adjustment, made with a smaller hex hey, provides approximately 1 degree per 15 turns. 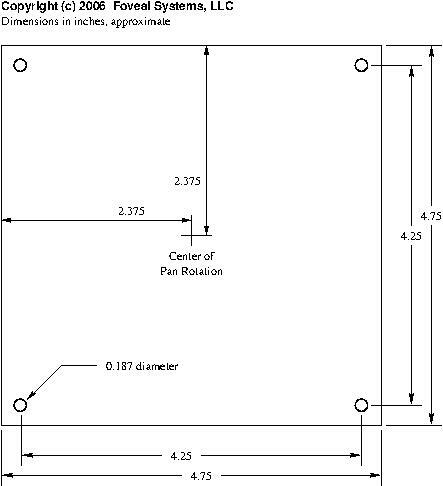 All RM1 Side Views have the same dimensions. 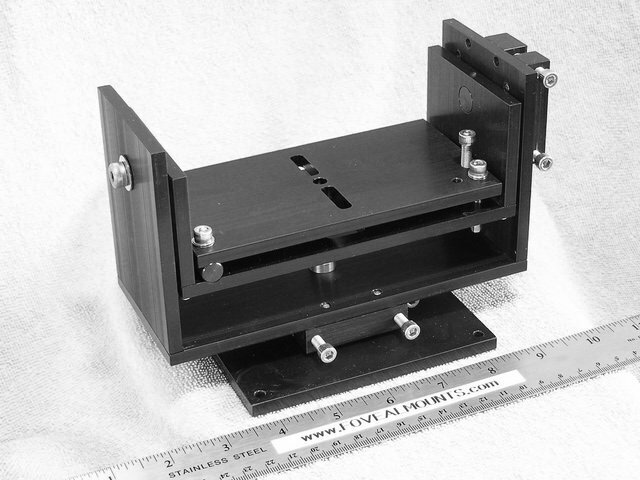 There are four mounting plates available for the RM1 mounts (above). no mounting plate The pan pivot has two 8-32 threaded holes in it. 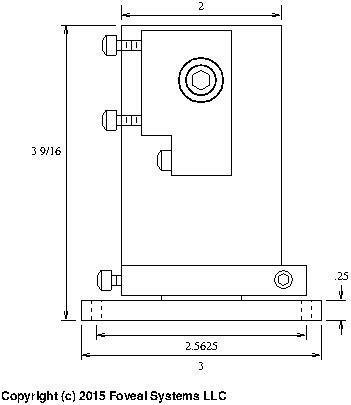 -SMP3 Square Mounting Plate suitable for general mounting to flat surfaces. 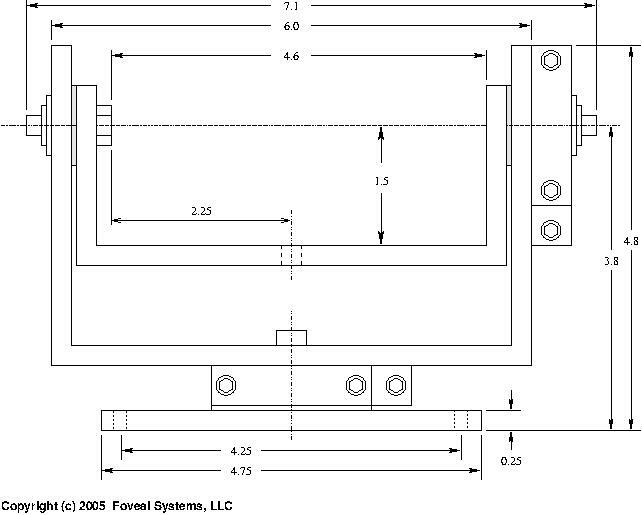 † For more information, see Foveal Mounts - T-Slot Mounting Plates. 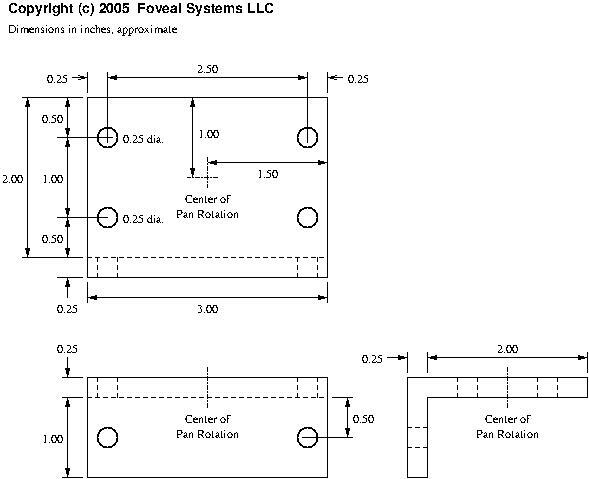 We also can design customized Mounting Plates to your specifications. 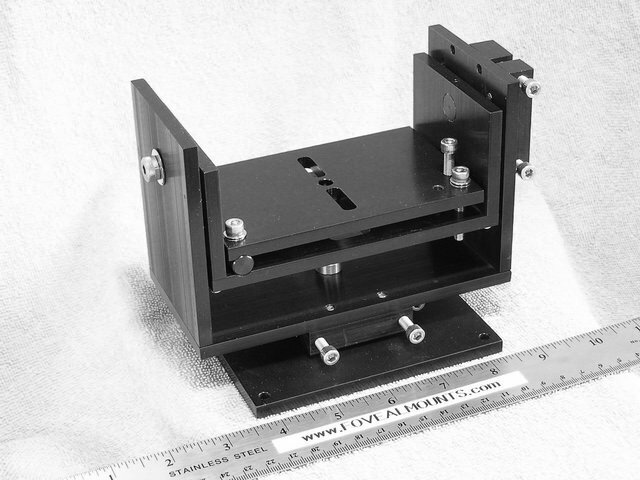 There are four mounting plates available for the RM2 mounts and RM3 mounts (below). no mounting plate The pan pivot has two 10-32 threaded holes in it. -SMP4 Square Mounting Plate suitable for general mounting to flat surfaces. 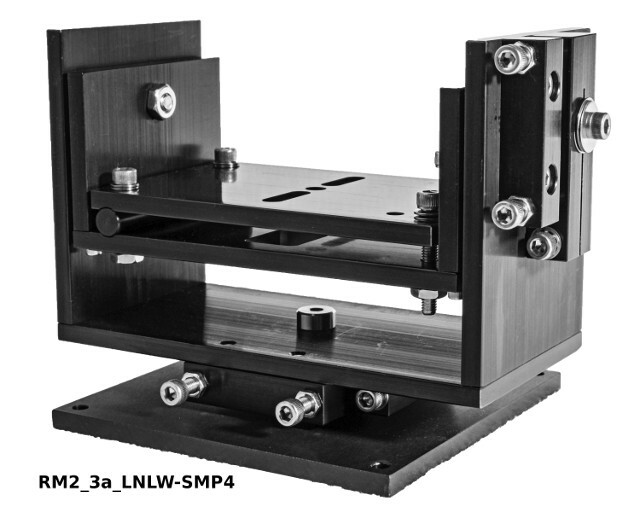 ‡ The dimensions for the RMP and LMP mounting plates for RM2 and RM3 mounts are the same as for the RM1 mounting plates (above). RM2 Specifications Prices and Delivery All RM2 and RM3 Side Views have the same dimensions. RM3 Specifications Prices and Delivery All RM2 and RM3 Side Views have the same dimensions. 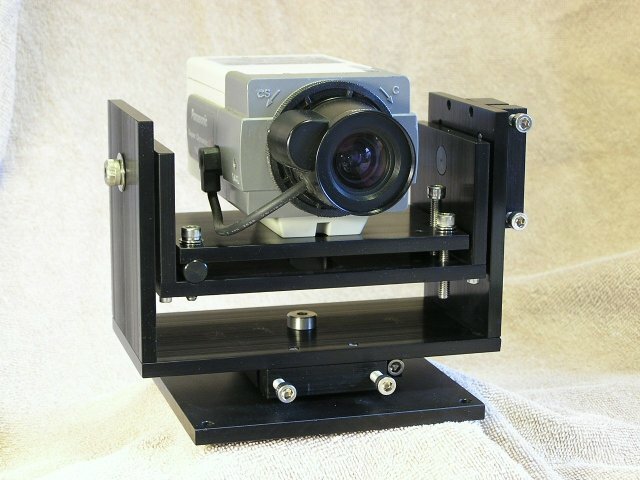 Adjusting camera mounts can become tedious in tight or inconvenient spaces. 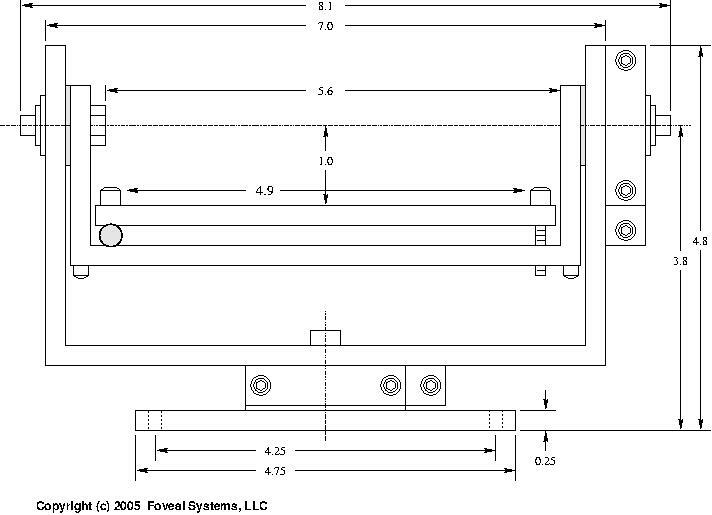 We have made the Rigid Mounts customer-configurable, so alternative placements of the adjustment screws are possible. 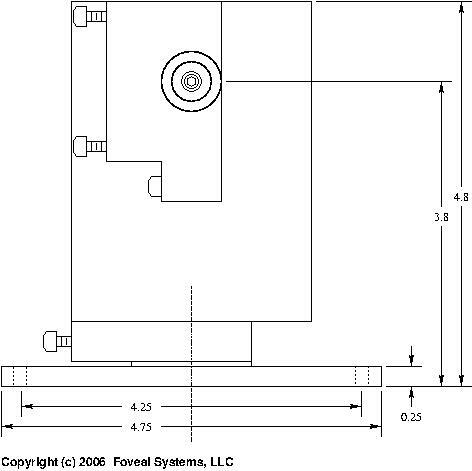 For example, it may be more convenient to have the tilt fine-adjustment screws available from the top or back of the mount, relative to the pan fine-adjustment screws. As these drawings show, they can be moved. Similarly, the tilt adjustments can be moved to the left side, relative to the pan fine-adjustment screws. The 3-axis mounts can be reconfigured as shown here. And, of course, the Rigid Mounts can be hung base up. Also, many cameras have mounting screws on top of the case, which means they can be hung from the top directly. And there are a few cameras where the mounting screw is on the side. 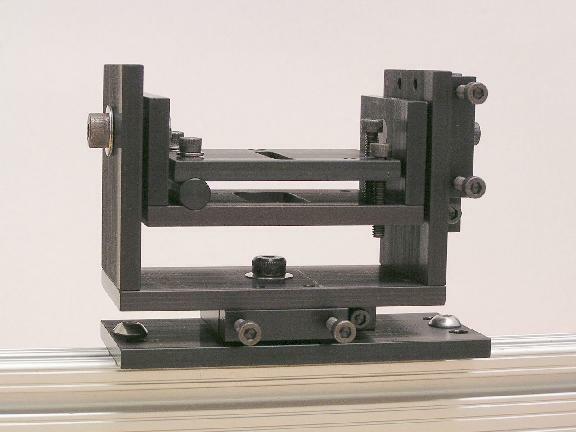 The base adjustment, which normally changes the pan angle now changes tilt, tilt changes pan, and the roll adjustment still changes the roll angle. 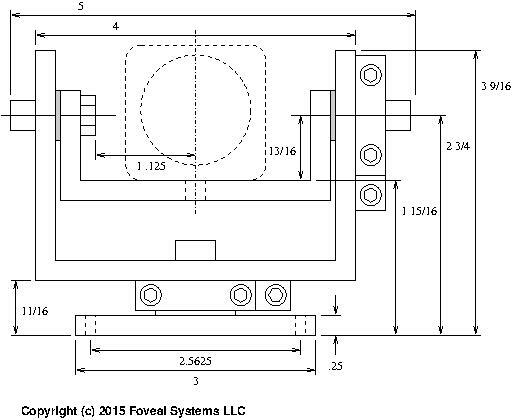 If you need to verify a particular configuration, please contact us. 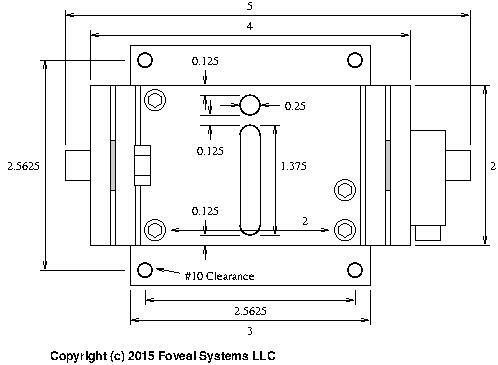 For a less expensive, less robust, two axis mount that features fine adjustment and locking of the pan and tilt axes, see the Foveal 2-Axis Fine-Adjustment Camera Mount. 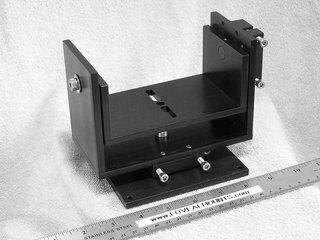 B & B Model Shop Services, Inc. is a partner in the design and construction of the Foveal Rigid Camera Mounts.